As you know, last week was Walk the Plank Wednesday. I asked for you to write a few words about what you love the most about Pirate101 so far and why. You all left some amazing responses and I wanted to go over them with you. 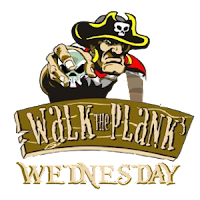 If you keep reading, you can see how your fellow community members feel about Pirate101 and what they are enjoying as well as the winner of this months Walk the Plank Wednesday. OK, what I like about Pirate101 is that the new combat system is more interactive than that of Wizard101. I know I like Swashbucklers! I like their weapons, their attacks, their critical strikes, and especially their abilities. Thanks for having this contest thingyyy! I love the new companions and all the new pets. It's so cool seeing new NPC's and worlds! These are all amazing answers and I would love to give a tier 7 KIFG to all of them but then WtPW wouldn't be as special or fun. I loved what they all had to say but to me, Smileys answer hit a home run. To be honest, I never thought of it that way. I know, it sounds silly how I never clicked on that, but it is true. In Wizard101, we see that Triton Avenue, Cyclops Boulevard, and Firecat Alley are all the same except they have different color schemes and NPC's while in Pirate101 the different areas are completely different from each other and have different things to offer. Don't get me wrong, I love the Wizard City areas, but Pirate101 does make the areas more unique. Congrats Smiley! You will be sent your code when KIFG codes are back up and running. I love the detail they put into the dungeons and street battles.